The Walden School Young Musicians Program provides an unparalleled creative summer experience for musically inclined students ages 9 to 18. 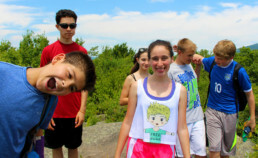 Part school, part camp, and part festival, the program convenes each summer for five weeks in the beautiful Monadnock region in Dublin, New Hampshire. Through rigorous and innovative daily instruction, students hone their musical and creative skills within a supportive community of like-minded peers and mentors, with a goal of improvising and composing original works. Students present their improvisational or compositional works in a concert setting. Nearly all students compose at least one piece during the course of the summer, and many compose more. Our organic approach leads students to discover new concepts for themselves. Teaching composers how to manipulate sound on software and use recording technology. Development of particular skills, exploration of particular topics, and immersion in many genres. Surround yourself with the beauty of Mount Monadnock in Dublin, New Hampshire. Situated on 365 wooded acres, the Dublin campus is perfect for getting away. Mountain hikes, swimming in Dublin Lake, shopping trips, sports, dances, and open mic nights create a strong community. The Dublin campus comprises 10 buildings, including the Louise Shonk Kelly Recital Hall, arts building and studios, and library. Each summer, the academic buildings become music studios with 20 pianos, two of which are concert grands. The Walden School fosters a climate of mutual respect so all may take the creative risks necessary for artistic growth. We encourage everyone to listen to and learn from themselves, as well as from one another. 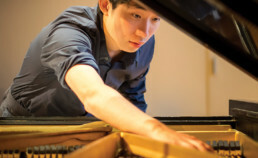 Learning at Walden is grounded in the school’s unique musicianship course, utilizing improvisation and composition for musical growth. Students take courses on theory, composition, literature, computer music, and chorus. By the end of the summer, each student has completed at least one composition. Guest artists, faculty members, and fellow students perform and critique these newly composed works. Our staff takes an active role in Walden’s community. The faculty lives alongside the students, eats meals together, and participates in school-wide activities. We believe that by participating together, we can create an environment where community develops and creativity flourishes. Our faculty hold degrees from acclaimed institutions, such as the Eastman School of Music, Yale University, and more.